Welcome to the Team17 100 games retrospective, celebrating our 100th release, PLANET ALPHA. In this chapter we’re looking back at 1995, an historic year in Team17 history, when Alien Breed made the leap into three dimensions and when the studio changed forever, following the discovery of Worms! Don’t forget to check out our previous chapters on 1991/92, 1993 & 1994 for more retro goodness! Putting the “team” in Team17, ATR: All Terrain Racing saw Qwak’s Jamie Woodhouse join forces with Body Blows creator Danny Burke to make a particularly beautiful arcade racer. ATR’s wintery stages were also tweaked and released as a special Christmas Edition Amiga Format cover disk in late ’94. Aside from a disappointing 38% review score in Amiga Power, ATR was generally very well received, with other mags rating the game around the 70-90% zone and raving about both the graphics and handling. Proving, we’d argue, that Woodhouse and Burke made a better game together than they would have apart. Go team! After the success of Arcade Pool in 1994, a mini-franchise of sorts was launched, the Arcade Sports series! In truth it didn’t last all that long. Arcade Pool would eventually get a sequel, while a promising “Sensible Soccer” style Amiga cricket game called Final Over: Arcade Sports Cricket was cancelled around 1995. But that’s a story for another time! Kingpin took the philosophy of Arcade Pool – budget price, accessible gameplay and authentic atmosphere – and applied it to ten pin bowling. A simple swing/power control interface, tried and tested by countless other bowling games, made Kingpin easy to pick up so that just about anyone could play and have fun. Which was more important than you might think when you consider that Amigas were, at least occasionally, installed as family computers and would have been used by people of all kinds of gaming tastes and skill levels. For extra authenticity the in-game digital scoreboard was modelled exactly like the video scoreboards you would have seen in bowling alleys of the time – and probably to this day – while the sound effects were recorded directly from the real thing. Special thanks in the manual even went tos to Wakefield’s “Superbowl 2000”, just down the road from the Team17 office for help, info and a doggy lane 7! Alien Breed voice artist extraordinaire Lynette Reade also popped in to play the bowling alley PA operator to make dry announcements about the car park! Just like the real thing. Though the Amiga had ruled the roost of home computer gaming for many years, it was clear by the mid-Nineties that its days were sadly numbered. Platform holder Commodore had gone out of business in 1994, leaving the future of the hardware uncertain at best, while the IBM PC had begun to make huge strides in the wake of Windows 3.1 in 1992. The tide was turning, and Doom (a game that needs no introduction) was instrumental in that shift of the gaming landscape. Everyone wanted their own “Doom clone”, and with id Software expressing no interest in porting the real thing to Amiga, the doors were wide open for Team17 to blast through with their own. But how could you create something so advanced on the ageing Amiga hardware? York based Andy Clitheroe had the answer… Prepare for jargon! If all the technical info above makes your head hurt as much as Andy’s did on that fateful day, then all you need to know is this… Alien Breed 3D was the real deal! It was Doom… On the Amiga! And it wasn’t just a tech demo, it was great fun to play! To understand the impact it had on Amiga gamers, take a look at the review scores. Every single Amiga mag in the UK rated AB3D over 90%! Although it ran in a little window in the middle of your TV screen, the game had it where it counts! The action was fast and frantic. The weapons dispatched enemies in a satisfying meat explosion and the game even found time to show off, with technical wonders like stairs! ramps! and underwater bits! In 1995, on the Amiga, this was astonishing. 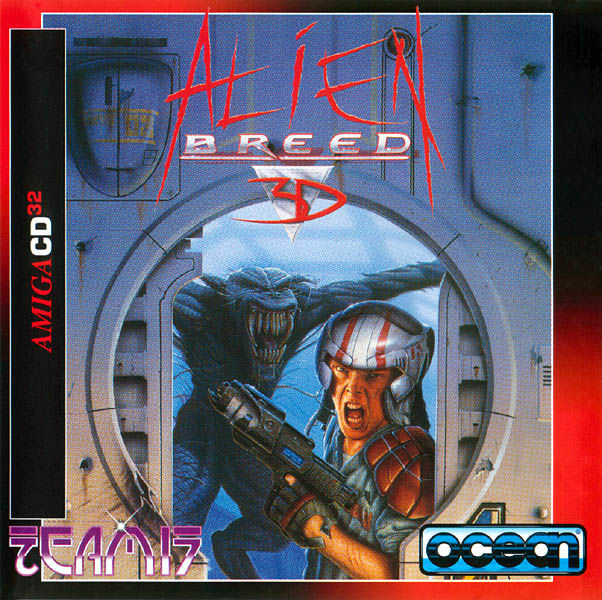 Alien Breed 3D was also released on CD, complete with an enhanced soundtrack and more levels! 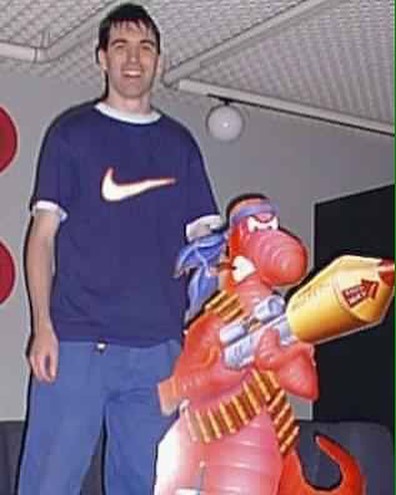 After five years of creating games almost exclusively for the Commodore Amiga, Team17 was catapulted into the world of multiformat development when a young lad called Andy Davidson, with an incredible imagination and talent for programming came to Team17 with Total Wormage, the game that would eventually be Worms. 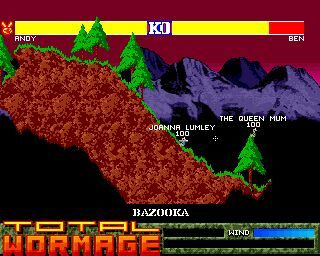 Originally submitted to a coding contest in Amiga Format, the magazine was flooded with so many entries that Total Wormage went virtually ignored, leaving Davidson to pitch the game to Team17. “Going with Team17 was important to me because of their support of the Amiga, and it meant I was able to work with some very talented people.”A group of Team17 staff members were assigned to help Davidson finish the Amiga game, including founding member Rico Holmes on art duties. “The new background graphics were much better than I could have come up with myself,” says Davidson. That’s your lot for 1995! In the next chapter we’ll delve into the post-Worms world of 1996, featuring the game’s first expansion, Alien Breed 3D’s ridiculously ambitious sequel, the long-awaited follow-up to Project X and our very own Zelda-alike, The Speris Legacy! In the meantime, don’t forget to check out the previous chapters on 91/92, 93 & 94 and share your own Team17 memories with us on Twitter, using #100Team17!